American coffee company and coffeehouse chain, Starbucks is hoping to open a new outlet in Rotherham. With 21,000 retail stores in 66 countries and around 800 in the UK, Starbucks had plans to open hundreds of stores in the UK over the next three to five years. In addition to traditional high street, retail park, kiosk and other concessionary activity, 200 were expected to be drive thru operations. For Rotherham, a planning application has been submitted on behalf of Rotherham Foundry Pradera Ltd, the owners of the Foundry Retail Park at Parkgate for a 1,959 sq ft drive thru coffee shop which could create 15 new employment opportunities (full time and part time). Situated on the existing car parking on the north western side of the established retail park, the unit would be situated to the east of Sofaworks and directly north of The Range and Bensons for Beds. The plans, drawn up by consultants at Montagu Evans, state: "The development is proposed to complement, and be ancillary to, the existing retail and other facilities available at the retail park to improve the shopping environment for customers. The scale of the development and the type of occupier is commonly found on retail parks across the UK. Coffee shops enhance the shopping experience for customers in town centres, retail parks and elsewhere. The proposed unit will be sited centrally within the scheme, as well as close to the pedestrian access to the site from Great Eastern Way." As the site is not located within a designated town, district or local centre, officers at Rotherham Council have asked that a sequential test assessment be undertaken in line with national and local planning policies. Sequential tests ensure that development is located in the most sustainable location first (usually in town centres), before other, less sustainable locations are chosen. After assessing the potential for sites located within nearby Parkgate district centre, the applicants conclude that only one unit is of suitable size but is "not an appropriate location for the development of coffee shop, with a drive thru format." The plans add: "Parkgate district centre, which is formed of many small, independent commercial ventures, is not realistically attractive to a national multiple trader such as Starbucks who seeks locations well related to other national operators. Were this application to be refused in terms of the sequential test, there is no realistic prospect of Starbucks deciding to invest in opening a coffee shop at 122 Broad Street instead of Foundry Retail Park. Accordingly, the objectives of the sequential test – to direct investment to the most suitable locations – would not be met by such a decision." 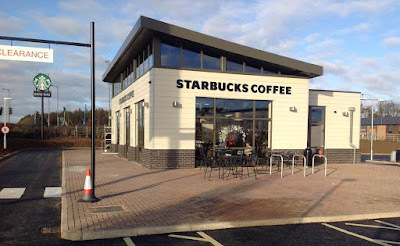 The first Starbucks in Rotherham is located within Woodall Serices on the M1. Here, plans are also being progressed to convert the former Police building into a standalone Starbucks outlet. Starbucks partners with franchisees and developers such as EuroGarages and 23.5 Degrees Ltd and the Seattle firm made a pre-tax profit of £1.05m in the year to September 2014 in the UK, compared with a £20.5m loss the previous year. Gross profit for the year to 28 September 2014 rose 24% to £98.8m.